Requirements: RNs with at least 1 year of experience, preferably in the ICU or Dialysis field. Role Highlights: Acute RNs often find themselves working in a fast-paced environment, with no day being the same. As the role comes with a variety of responsibilities, it’s the perfect opportunity to grow your communication and leadership skills. 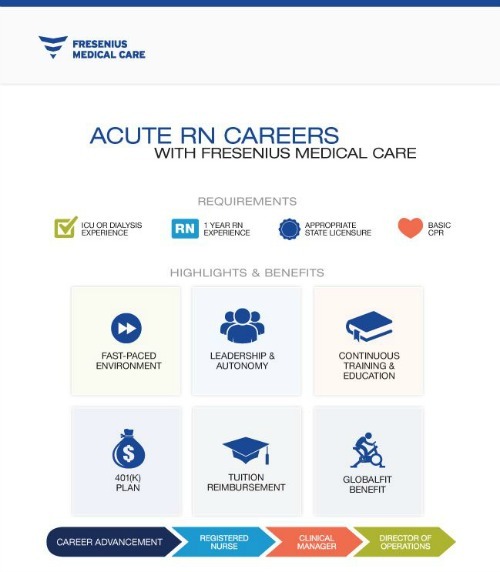 Along with these soft skills, Acute RNs at Fresenius have access to our world-class training and development programs to drive them to excellence and advancement in the clinical field. Benefits: At FMCNA, your health and happiness is our top priority. That’s why our benefits go beyond the basics. From health insurance and 401(K) plans to Employee Assistance Programs that offer confidential counseling at no cost, our benefits are tailored to meet your personal needs. Whether you’re pursuing your next degree or making a commitment to a healthier lifestyle, you can find support through FMCNA. Getting Ahead: Not only do we want to see you grow at FMCNA, we want to support you as you climb the ladder. Acute RNs have clear advancement opportunities within the company and can find themselves progressing into roles like Clinical Manager and Director of Operations. Fresenius Medical Care North America is the premier health care company focused on delivering the highest quality care to people with renal and other chronic conditions. We are the world’s only vertically integrated renal company, offering specialty pharmacy and laboratory services, as well as manufacturing and distributing the most comprehensive line of dialysis equipment, disposable products and renal pharmaceuticals. With over 2,200 dialysis facilities and more than 20 years of leadership in the industry, there has never been a better time to join our team. Our employees have the opportunity to work, learn and grow alongside some of the best professionals in the industry. Ready to apply? Take a look at our full list of acute dialysis nursing jobs as well as our other RN career opportunities to start your journey today.